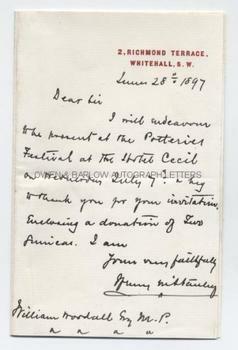 HENRY MORTON STANLEY Autograph LETTER SIGNED. SIR HENRY MORTON STANLEY (1841-1904). British (Welsh) African explorer and journalist. 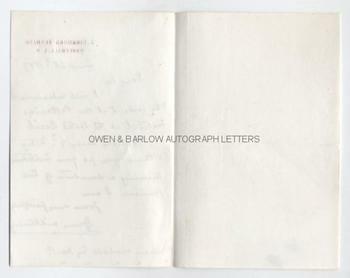 Noted for his expedition in search of David Livingstone and for the Emin Pasha Relief Expedition. ALS. 1p with integral blank. 2 Richmond Terace, Whitehall, S.W. June 28th 1897. To William Woodall. "I will endevour to be present at the Potteries Festival at the Hotel Cecil on Wednesday, July 7th and beg to thank you for your invitation. Enclosing a donation of two guineas. I am yours very faithfully." 12mo. 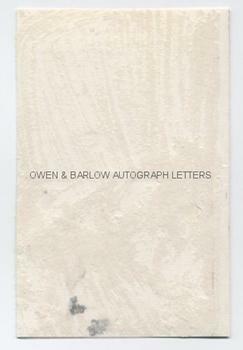 Approx 6.25 x 4 inches. Mounting traces on verso of integral blank leaf, else fine. From the album of the radical Liberal M.P. and Wedgewood Trustee, William Woodall.